My morning swim practice did indeed happen. 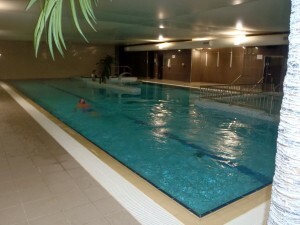 A full hour workout in our Maldron Hotel’s 25m pool….a rarity of length for most hotels. Afterwards, it was wonderful to see that as daylight eventually appeared, we were to be treated by yet another clear and what turned out to be a ‘rainless’ day. 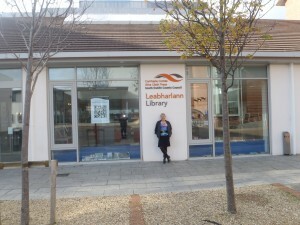 Our morning and afternoon shows were only a block away in Tallaght’s city square library, located in huge city block complex that houses the local library, arts centre, theatre and a series of cafes and shops. By 9:30 a.m. it was a hub of activity. 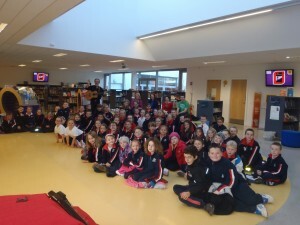 Once again we given a royal welcome by enthusiastic library staff and audiences of school children and area vistors. Following our shows we were treated to a lovely lunch at the theatre by Una, the head of the library,and afterwards we started our 3 hour mid-afternoon drive to Cork City. Arthur did a fine job of driving, (as always since he is the designated and registered driver), and we were more than happy to arrive at our accommodations at Lancaster Lodge in downtown Cork City. 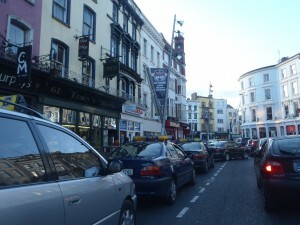 Cork is a hustling and bustling cosmopolitan city and there was no lack of activity as we arrived in the heart of rush hour. Hooray for our GPS (the British accented voice of Jane) for navigating us to our downtown hotel destination with only a street name and not a specific address being typed in. Technology is indeed amazing! On arriving, we unpacked and chilled out for a bit, catching up on emails etc. 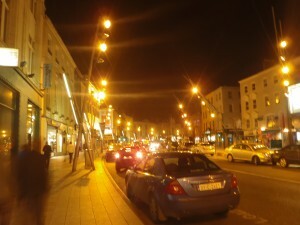 then ventured out for a late dinner and walk about the downtown. Things were hopping in the shops, restaurants and bars at 9:30 p.m. and apparently Halloween comes early here with many dressed up in costume on a busy Thursday night. Quite entertaining. Back to the hotel for tea and last minute catch ups for the day. Tomorrow will be a treat as we are being transported via taxis to our 2 performances and lucky Arthur, he doesn’t have to drive for a change!